Fabrizio Meoni, one of the great riders in cross-country rallies, died on Tuesday, January 11 after a serious crash on the 11th special stage. Meoni was pronounced dead after the medical rescue team failed in its attempts to revive the KTM rider. Meoni's death came just one day after fellow KTM rider Jose Manuel Perez had lost his life due to a crash on the seventh stage. Meoni had made it past checkpoint one with the other leading bikes, in what was a high-speed area of today's stage. 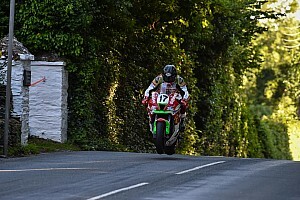 He stopped with the rest of the riders, including his teammate Cyril Despres, who was leading the standings, to refuel before the accident happened. One of the first riders on the scene was Yamaha's David Fretigne. After witnessing the crash, he stopped, along with KTM's Marc Coma. Fretigne launched the distress signal on the Italian's KTM in order to have the medical team immediate fly to the scene. Unfortunately, Meoni was already in heart failure when they arrived. "I really don't understand what happened," expressed Fretigne. "We had just lost ourselves and we were looking for the right track. Cyril (Despres) was on the good track and took off. 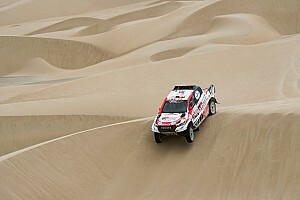 Fabrizio followed in his dust and 300m later I saw (Marc) Coma with his hand in the air so I stopped. I immediately knew it was serious." "I then waited for the helicopter because I couldn't just leave. I think that we should carry on for him and for Richard (Sainct)... He would have wanted us to. It was his passion." The KTM veteran rider's crash was one that did not look particularly bad, but in the end the popular Italian was determined to have died because of a broken neck. 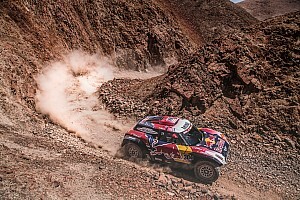 The leading riders, including Meoni's teammates, were not informed until they finished the event today by the Dakar race director Patrick Zaniroli. All other riders and competitors were not informed at that time, the news will be released at the Kiffa bivouac after the long liaison. "I still can't believe it. It's horrible. There was only one Fabrizio," said Coma. "He was unique. His age! His navigation! For me, he was a reference and will always be. I'm young in this race being here only since three years. He was an example for us. Fabrizio was a 'gentleman'. And now he's gone. We all have to discuss, the bikers, the teams and the organisation to take the good decision. It's very difficult for the moment to find a good solution." Meoni won the Dakar Bike titles in 2001 and 2002. 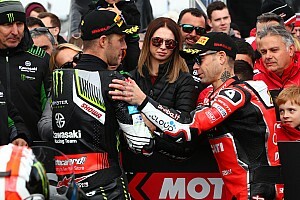 At the age of 47, a birthday he celebrated on the first day of competition (December 31), the Italian had started his 13th Dakar. 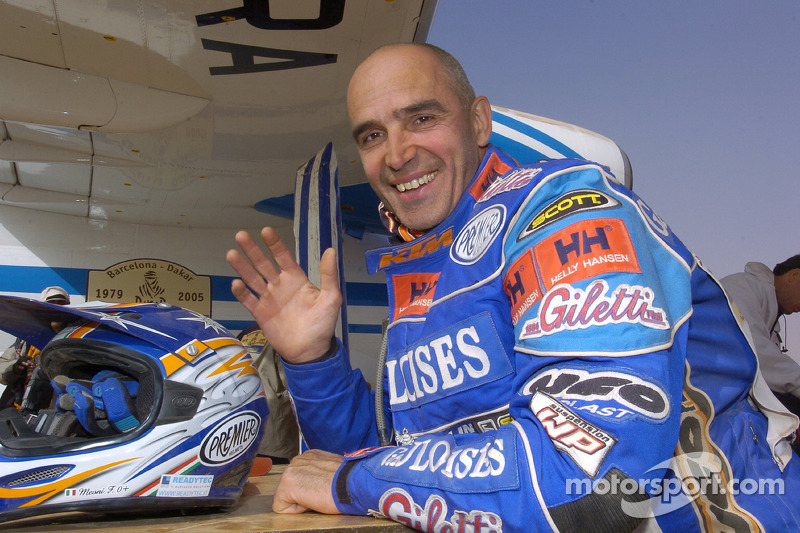 Before he landed the Gauloises Racing ride, Meoni was one of the privateer's who exemplified the spirit of Dakar. Respected by his peers, the death of Meoni has shaken the bike community. The veteran rider was known for his comraderie, his sense of humour and his love of rally raids. Meoni started cross-country rallying in 1989, and his favorite stages were the one consisting of a lot of sand. The veteran rider won numerous stages and events over the years. To always give his best at each rally -- that was his main goal. The Italian leaves behind his wife Elena, his son Gioele and daughter Chiara.